Apple's latest iPad tablet has been an incredible success and generated a lot of interest from photographers soon after it was released. Instead of hauling a laptop along on vacation or to a photo shoot, a photographer can bring the lightweight iPad and take advantage of its large screen, third-party software, and online access. The iPad is great for reviewing photos on-site using something other than a camera's small LCD, editing photos, presenting a photographer's portfolio, and more. This fully updated 2nd edition of the iPad for Photographers will help novice, intermediate, and pro shooters to: • Get photos onto the iPad. Import using the camera connection kit. 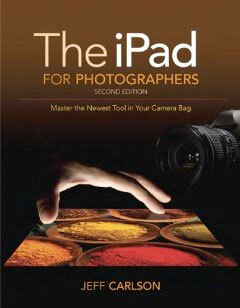 • Take photos with the iPad. • Back up photos. Copying photos from memory cards; using iCloud Photo • Stream as online backup; uploading files to Dropbox; and so on. • Organize your photos. • Rate photos and assign tags in the field--instead of waiting until you get home! • Edit photos on the iPad. • Share photos with others: iCloud Photo Stream, play on an Apple TV, and more. • Create your portfolio. Use portfolio software to give impressive presentations to prospective clients. Great for wedding photographers meeting people face to face, for example. • Video. Edit clips in iMovie, create slideshows, rough cuts, and more. In addition, photographers will learn other clever uses for their iPad, such as triggering the shutter using an iPad; using the screen as a fill flash; storing PDFs of camera manuals, books, etc. ; and much more!